Scaevola lobelia sericea (Vahl) Benth. 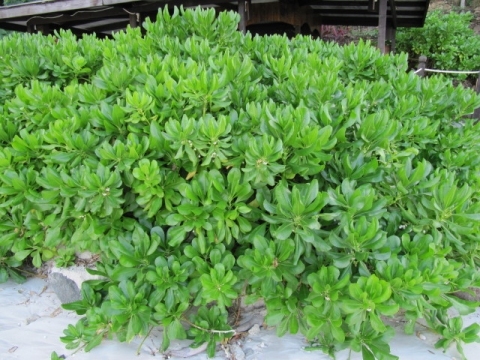 Beach naupaka is an erect, spreading, evergreen shrub or small tree with somewhat succulent, soft-wooded, pithy stems. It usually grows up to 4 metres tall, with occasional specimens to 7 metres. Eastern Africa, through southern Asia to Papua New Guinea, Australia and the Pacific Islands. Beach naupaka, it is found every island of Maldives. We call it Magoo and also Gera.